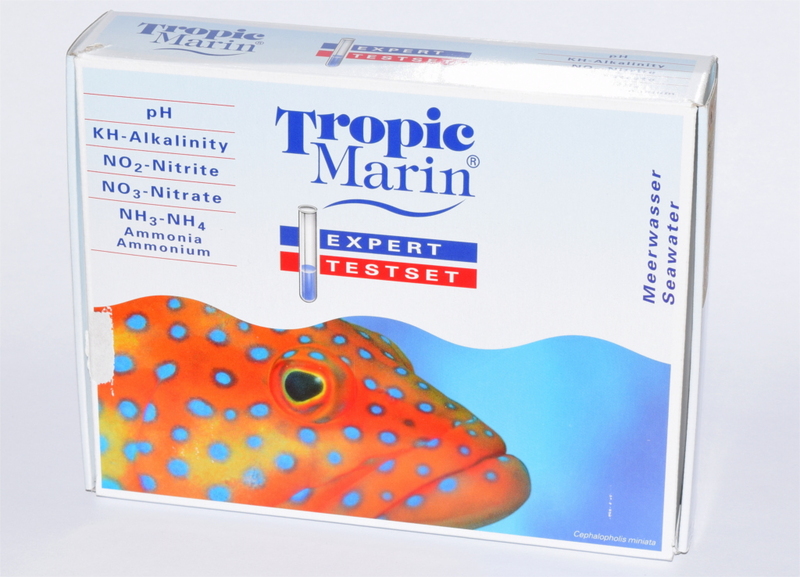 Today we’d like to present to you the interesting marine water test Tropic Marin Expert Testset. Tropic Marin recommends that the pH be kept between 8.0 and 8.5. We’d like to add here that the pH is usually higher in the evening – during the day, the carbon dioxide is consumed by photosynthetic organisms; while during night CO2 is produced, lowering the pH. 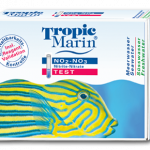 The Tropic Marin pH test allows us to measure pH values between 7.4 and 9.4, a very wide range that should cover the conditions of any marine tank. We can use this test around 100 times, and it expires 12 months after opening, which means that we could test our water twice a week for a whole year. This is one of the most straightforward tests we have ever used. After transferring 5 ml of tank water to the cuvette (using the syringe) we simply add 1 drop of the reagent and then compare the water color with those printed on the sheet (with 0.2 intervals). The resulting color is easy to interpret; just place the cuvette on the sheet and look at it from above. The alkalinity level recommended by Tropic Marin for your tank is between 6° and 10° dKH. This test should also last for about a year if used twice per week (around 100 times depending on the alkalinity level, expiring 12 months after opening). After transferring 5 ml of tank water to the cuvette, we add the reagent drops to measure the dKH. Every drop equals one German degree, we stop adding drops when the water color turns from green to red. The color turn is not very obvious, and we saw some transition colors. 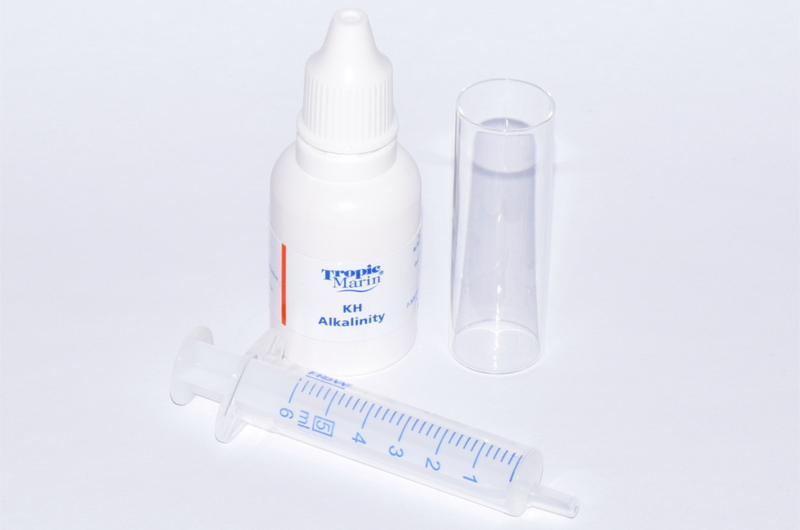 We suggest that you use the higher accuracy scale by adding twice the amount of water (10 ml); in this case every reagent drop will correspond to 0.5 dKH. Thanks to a useful chart we can then convert the German degree to other scales such as English degrees, French degrees, mg/l, CaCO3, and mval/l CaCO3. We found this test was not very accurate. It gives us results that can be up to 1 degree uncertain, even in the high sensitivity version. 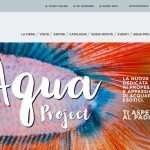 It is not that bad, as a 1 dKH change is not terribly harmful to our tank, but it looks like Tropic Marin realized the low precision of the test, as they have produced a new alkalinity test called Kh/Alkalinity-test professional, which has a precision of 0.1 dKH. Unfortunately this is not included in the set. 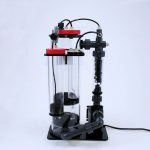 This test is very important, as it tells us if our tank’s filter is working properly. 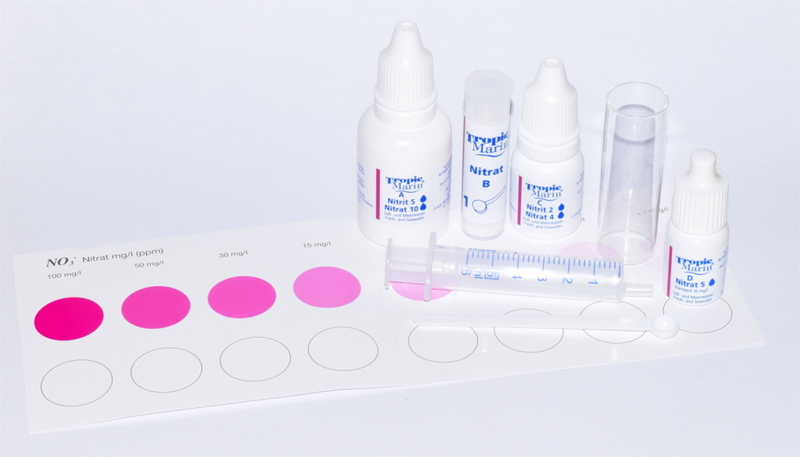 Moreover, it is a great idea to use the same reagents for two different tests. Once our tank is mature we won’t need to measure NO2 (Nitrite) that often, and we’d hate to just throw away full reagent bottles after the 6 months expiration time, when we still need to measure nitrates! 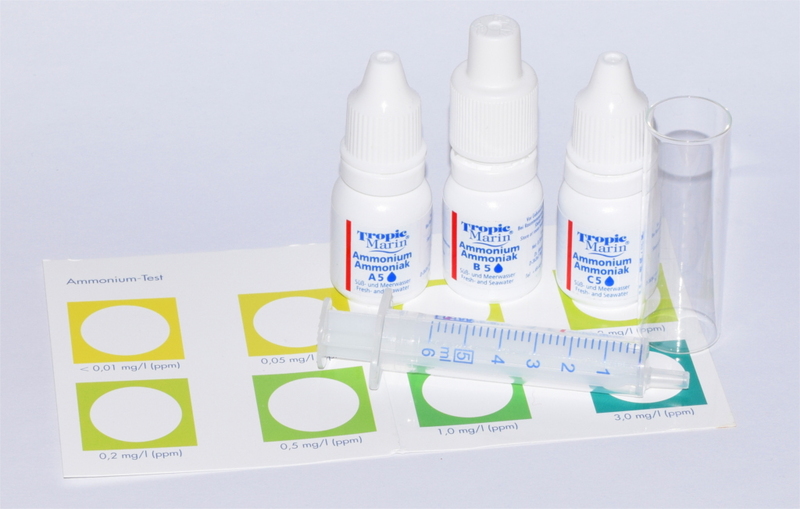 The reagents should last for about 40 uses, one test every 4-5 days. Tropic Marin recommends, for a freshwater tank, a NO2 concentration between 0.02-0.1 mg/l with a maximum level of 0.5 mg/l. 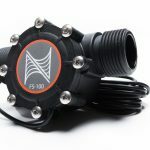 For marine tanks, the maximum value should be 10 times lower – below 0.05 mg/l, almost impossible to measure. As for NO3, 20 mg/l is the maximum level suggested for freshwater tanks, though some animals can tolerate up to 80 mg/l. In a marine tank, the limit for a fish-only tank is 20 mg/l, and 10 mg/l for a reef tank with live corals. 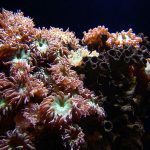 Actually, everyone here on the DaniReef staff would like to recommend keeping nitrate levels much lower (1-2 mg/l) to obtain best coloration of SPS corals (small polyp stony corals). The Nitrite test is a bit more complex than the first two: after filling the cuvette with the 5 ml of tank water, we add 5 drops of the reagent A, gently shake the cuvette and wait 3 minutes. We then add 2 drops of reagent C (jumping over the B reagent) and gently shake again. At this point we can compare the cuvette’s water color with those printed on the relevant sheet. 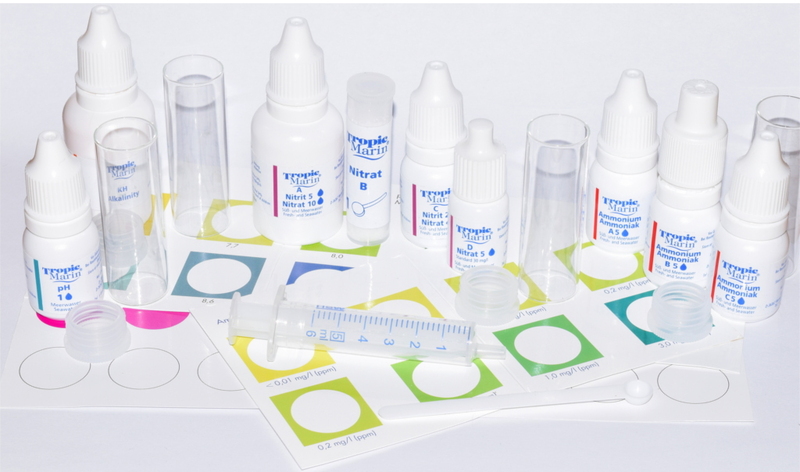 We wonder why the color sheet doesn’t look like the one for the pH test, where you can place the cuvette in an appropriate circular space inside a colored square. Here, you have to compare colors from a more distant white circle, which can be less accurate. The nitrate test has a similar procedure, with the addition of a small spoonful of reagent B between the A and C, whose amounts are double that of the nitrite test. After waiting for 3 minutes, we can compare the colors as usual. The scale seems very well done, with a good values range: <1, 2, 5, 10, 15, 30, 50, 100. We think it is especially good for marine tanks, where we are generally interested in the lower values of the scale when evaluating our tank’s condition. The expiration date is stated to be 6 months after opening, but the test comes with a D reagent bottle, which allows us to verify the state of the other 3 reagents. To find out, we repeat the test, and add 5 drops of reagent D to our tank water. 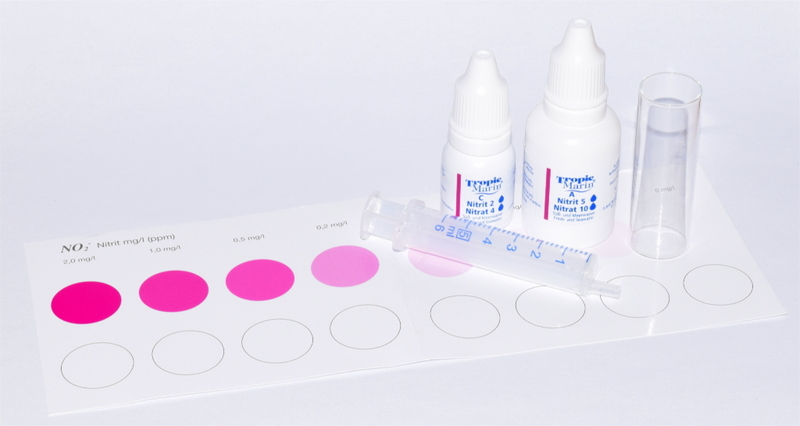 If the test results are at least 30 mg/l higher than before adding reagent D, we can consider our reagents good and still working properly. Ammonia concentration in marine tanks should be very very low (<0.05 mg/l, which is the first value of this test). Higher values are dangerous for all animals, and are usually a consequence of something not working properly. In a mature tank we don’t need to monitor ammonia often, as it should stay close to zero. because of this, we don’t mind that the reagents only last for 30 uses and expire one year from opening. We think two measurements per month should be more than enough. This test is not quite as easy as the first two we saw, but still very straightforward. After transferring 5 ml of tank water to the cuvette, we add 5 drops of the first reagent, then 5 drops of the second and 5 of the third, gently shaking the cuvette between each reagent. After 5 minutes we can proceed with the color comparison similar to that of the pH; it should be easy to find the right value. The scale goes from 0.01 mg/l to 3 mg/l as a sum of ammonium and ammonia values, it is divided into 8 values with a higher precision on the lower end of the scale (more values). Tropic Marin tells us that the component that is dangerous for animals is the ammonia, and the company has supplied a chart to convert the measured value (ammonium + ammonia) to just ammonia, in case we found a value higher than 0.5 mg/l. This depends on temperature and pH, which we need to know in order to convert the values on the chart.